It’s been a two and a half decade marathon but David Suchet has finally achieved his goal. With the airing of Curtain: Poirot’s Last Case on ITV this week, Suchet has performed in all seventy Hercule Poirot novels and short stories as television adaptions. It’s an incredible accomplishment starting back in 1989 with The Adventure of Clapham Cook. The show and his performances have survived two different production companies and twenty five years of sufficient ratings to warrant bankrolling that next episode. Other actors have played James Bond and Doctors Who in the last quarter century but there has only been one man to play the part of Hercule Poirot. I had a feeling of giddy excitement leading up to watching this final send off. 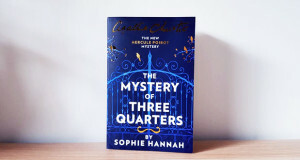 For TFW readers with long memories, you might remember that I rekindled my love for Poirot four years ago when I lived in Sydney and had a lot of downtime to myself. Even then, there was the anticipation of Suchet getting to the home stretch of Agatha Christie’s body of work and having only a few episodes left to film. This week, that moment finally arrived. Once the episode began, a lot of that enthusiasm and excitement ebbed away. 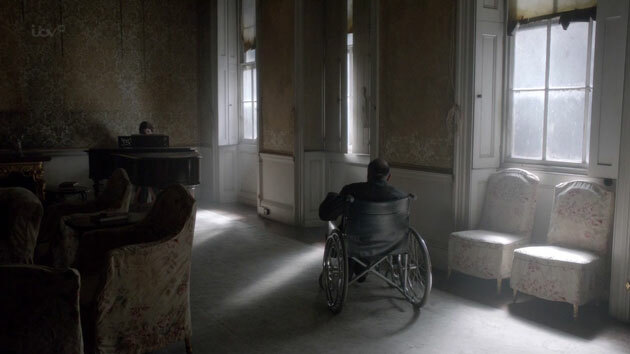 It only takes a cursory glance at the screenshots I’ve included in this blog to see that Curtain is not a particularly cheery send off for our beloved Belgian detective. Curtain sees the reuniting of Hercule Poirot and Captain Hastings (still played by Hugh Fraser) at Styles, the manor where the two first met in The Mysterious Affair at Styles. Poirot, now wheelchair bound and suffering crippling arthritis, is determined to solve one final murder before he passes. 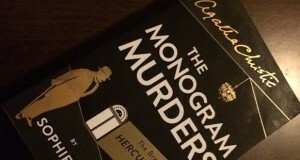 He talks to Hastings of five seemingly unconnected murders, all of which have the presence of X, a man or woman that Poirot believes is the true instigator of the crime. Poirot now believes X to be a resident at Styles and charges Hastings with being his eyes and ears and to ‘look through keyholes’ so they can prevent any further deaths and bring him to justice. Curtain is a relentlessly dour and gloomy episode where the specter of death hangs heavily over the proceedings. Visually, it is jarring to see the once proud and mighty Poirot, looking gaunt, wheezing and perpetually near death. 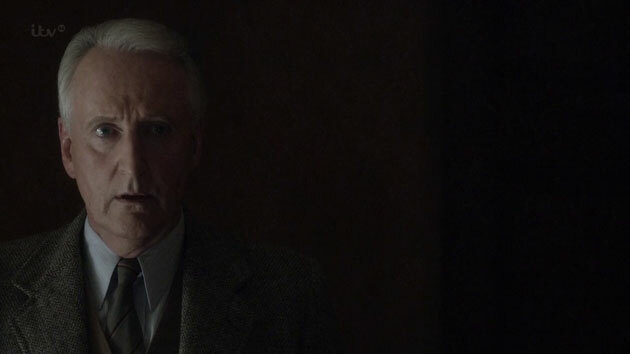 His loyal friend Hastings is also alone, having recently lost his wife in Argentina to illness and struggling to reconnect with his daughter Judith. Judith spends most of the film being courted by the horrible, sleazy Allerton, a married man who is estranged from his wife. She also argues constantly with Hastings, advocating euthanasia at the choice of the next of kin and blasting the selfishness of the elderly for standing in the way of the young. All in front of Poirot. What a classy lady. 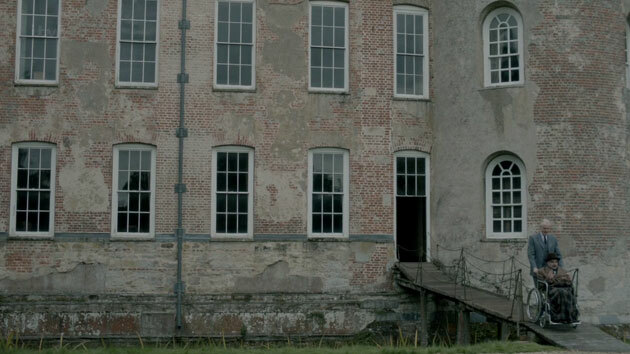 All this takes place in a setting, Styles Manor, which seems to be aging as rapidly as Poirot. The building is run down, covered in cob webs and falling to pieces. Yes, Curtain is a gloomy, nihilistic work and there is a nary a splash of vibrancy or colour to be seen on the screen. You know this is a dark and bleak tale when Hastings seriously considers murdering someone. The stand off between Poirot and X, his ‘perfect’ murderer, is not a traditional investigation like the other cases in the past. There are no trail of clues. No red herrings. No suspects. Poirot explains that X murders indiscriminately, for the love of killing, and has no conventional motive tying them to the murder victims. Therefore you just watch the events unfold in Curtain, as the body count rises, without any real idea as to what is happening. Eventually Poirot himself is claimed and the traditional denouement comes in the form of a letter, four months after his passing. The way in which Poirot apprehends his perfect murderer is faithful to what happens in the novel. 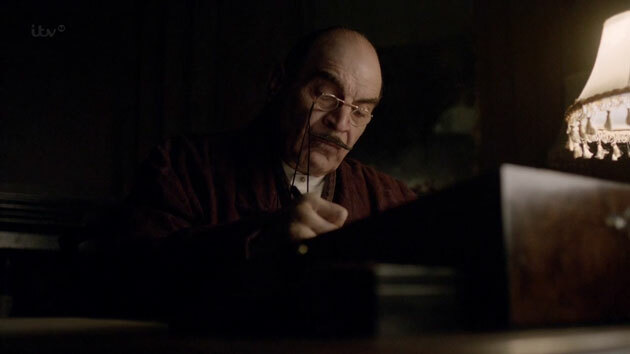 There is some artistic license taken in the television adaptation where Poirot’s faith in Catholicism is amplified, as his mind weighs heavily on what the right thing to do is and whether he can find redemption before he passes. I think this was a great inclusion in the episode as it gives us a very touching parting scene where Poirot ends up seeking forgiveness not from a pastor but from his lifelong friend Hastings. It was about then that I got some dust in my eye. I doubt I will ever watch Curtain again. 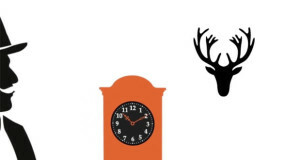 It’s a sad, teary and sombre farewell between two friends in the twilight of their life. This is an episode where the murder mystery well and truly takes a backseat to the relationship between Poirot and Hastings. It is consistent as ever, right to the very end. Even when he is terminally ill, Poirot is a perfectionist, obsessed with order and examining puzzles with his famous ‘little grey cells’. Hastings is impulsive. Acts on instinct. Quick to make rash decisions. And the two of them remain best of friends to the very end. I’m glad I watched it but once was enough. In future, when I feel like revisiting Hercule Poirot, it will be those jaunty earlier adventures. With a young, strapping Captain Hastings. With the hapless gumshoe Chief Inspector Japp. The vivacious and meticulous Miss Lemon. Those are my favourite memories of Poirot and those are the times I most look forward to revisiting. I have read Curtain and I’ll be listening to the audiobook as soon as it arrives. This will be my slow tread into these difficult waters. I’ll see if I can watch after listening. I’ve got a good imagination so my “Little grey cells” can fill in the blanks my eyes can’t see. It would be like watching a beloved grandparent die! I have friends who are Poirot fans, and the field is pretty evenly split between those who have seen the last episode and those who can’t do it. I’m not sure which side I’m gonna fall down on. Poirot seems more brave about facing his own death than fans are with dealing with it! THANK YOU!!!! I finally gave this post a good read over and you feel exactly as I do about Judith Hastings!!!! And she said it Not ONCE but TWICE!!! I think I hate her more than I hate Stephen Norton. Poirot knew he was evil, but sadly, in the case of Judith, Poirot’s heart would rule over his ‘little grey cells’ and he doesn’t see the ‘cold hearted’ woman that even her own father sees. C’est tragique! I’ve actually started on some Poirot fan fiction where Judith DOES give in to Stephen Norton’s jibbing and kills Poirot with a powerful pain-killer/sedative called Demo-veronal. In the Witness box, she will try to talk her way out by pleading the case for ‘E.D’ Expedient Death’, which effectually severs her ties with her father, when Hastings testifies against her!! Going into this episode, with a minor knowledge of Poirot episodes is one thing…watching and rewatching episodes and THEN confronting CURTAIN is just about undo-able. Poirot is known for three points of physicality….his clean shoes, the back of his ‘egg shaped’ head and his hands, with a ring on one pinky. When those points are seen in the first two minutes of curtain, you grab for a pillow. It’s heartbreaking! Curtain will NEVER be an easy episode for a true Poirot fan to watch and that’s a good thing. It means David did what he sought out to do and created a full person, with all the good and bad and endearing and annoying and everything else that comes with it. Agatha Christie s Poirot is a wonderful and brilliant show that lasted for many years, based on the ingenious tales of murder and mystery by the queen of crime herself, Dame Agatha Christie. David Suchet dissolves into the role of the great eccentric genius, Hercule Poirot, a character previously played on film by Albert Finney and Peter Ustinov. But none were as perfect for this part as David Suchet. And where would a detective be without his loyal companions, Captain Hastings, Chief Inspector Japp and Miss Lemon, all of them delightful and lovable, played by Hugh Fraser, Philip Jackson and Pauline Moran respectively. This is definitely British television at its best, and seeing these wonderful and ingenious novels and short stories come to life is really a treat. Different episodes also feature different stellar casts, Death on the Nile and Murder on the Orient Express come to mind. I also have to acknowledge the wonderful score composed by Christopher Gunning, that is really a wonderful tune and sets the tone for a fun time. Even after this show sadly had to end, it will always be re-watched and discovered by new people, and Suchet s performance as Poirot will be cherished and remembered forever.